The band releases an acoustic version of On The TV, from the acoustic EP, For All Here To Observe. As promotion for For All Here To Observe, their upcoming acoustic EP, the band releases a video of them recording Supernatural. The band release the official video for You Opened Up My Heart, directed by Croft. Aaron: The concept was a collaboration. We gave [Chris] some ideas of what we wanted visually: very graphic and high energy. He sent us a few examples of 3D projections. The cube felt a little bit ambitious for the budget. And we were like, ‘that sounds risky’, and we tipped up in the morning and it was a bit of a seat-of-the-pants thing…It’s a cube that has a projection that runs right the way round. To see it in person was incredible. It’s one of our best so far. 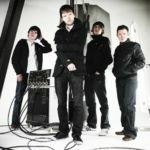 The band release a video for Through The Shadows, which is also released as a downloadable single with album pre-sales.